A real show stopper! The beautiful Italian glass bottle with whimsical fairy wings and wand makes the glitter inside sparkle and shimmer. It's unique, it's charming, it's a must-have! 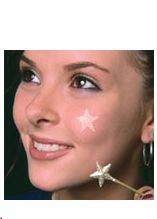 How to use: Dip the star end of the wand into the glitter, shake slightly, and press firmly against the skin. The dry glitter forms a sparkling star tattoo.